The Panasonic DMP-BD45 is a basic Blu-ray player that concentrates on doing one thing well: playing Blu-ray movies. If you want to access BD-Live content and other online features, you will need to look elsewhere. The Panasonic DMP-BD45 is a bare-bones Blu-ray player aimed at quality-conscious consumers who don't care about bells and whistles. As the entry-level model in Panasonic's Blu-ray player line-up, it lacks common features such as BD-Live, YouTube access and component video. The Panasonic DMP-BD45 is a Profile 1.1 Blu-ray player, which means it does not provide any of the features or benefits of Profile 2.0 machines (including online functionality). What it does provide is the same pristine 1080p video as its pricier stable mates; the Panasonic DMP-BD65 and Panasonic DMP-BD85. Although unquestionably overpriced for what it offers, the Panasonic DMP-BD45's excellent video performance makes it a worthwhile option for people who just want to watch Blu-ray movies on their HD TV. The Panasonic DMP-BD45 is quite compact, measuring just 49x430x207mm. While it's nowhere near as small as the Kogan Blu-ray Player Slim BD 2.0 Full HD 1080p, it should still fit inside your home theatre setup with minimum hassle. The Panasonic DMP-BD45 is surprisingly attractive for a budget-level Blu-ray player. A mirrored faceplate covers the tray-loading disc drive, while a flip-out door conceals the SD card slot. 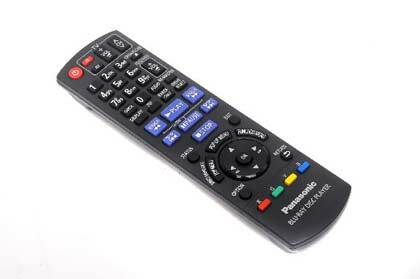 Panasonic has also included some basic playback buttons on the unit — handy for when you misplace the remote control. For connectivity, the Panasonic DMP-BD45 comes with just the basics: you get HDMI, composite video and optical digital audio. If you're looking for a Blu-ray player to hook up to your home network or high-end sound system, you'll definitely need to look elsewhere. Sadly, there is no USB port on this unit, which rules out USB media playback (DivX files aren't supported either). This is sure to frustrate novice users who purchased the Panasonic DMP-BD45 for its supposed simplicity. On the plus side, the remote proved highly responsive during testing and its chunky size should make it harder to lose beneath the couch. The Panasonic DMP-BD45's menu is clean and attractive, with basic on-screen text to guide novice users. Response times when flicking between menus was nice and snappy. For a budget Blu-ray player, the Panasonic DMP-BD45's interface is a winner. To test the Panasonic DMP-BD45's playback performance, we hooked it up to a 50in Sharp LC52LE820X LED TV and watched the Blu-ray edition of Terminator: Salvation, along with the DVD version of The Matrix. In both cases, the DMP-BD45 produced sharp and vibrant images with plenty of intricate detail and no major abnormalities. The player sports the same PH4D processing chip as its higher-end colleague; this did a great job of upscaling standard-definition video to 1080p. The Panasonic DMP-BD45 required just 18 seconds of prep time before it began playing a disc — a significant improvement over previous models we've tested. Once the disc was playing skipping chapters involved slight lag, though nothing we couldn't live with. All in all, there is nothing especially wrong with the Panasonic DMP-BD45. It produces excellent 1080p video, has good upscaling capabilities and is quite attractive for the asking price. However, for a Blu-ray player to still be Profile 1.1 in today's day and age is pretty unimpressive, to say the least. Even ultra-budget models from Kogan and Soniq feature Profile 2.0 support, so there's really no excuse for Panasonic not to include it. That said, the Panasonic DMP-BD45 is hard to beat on the performance front, which is the only reason to snap one up.